The longtime favorite First Hill museum is bringing snacks, drinks and art together (smart!) with a new happy-hour tour. Travel and books editor Megan Burbank and food writer Bethany Jean Clement went to snack, drink, look and evaluate how it all works. Welcome to Art Outings, an intermittent series in which Seattle Times critics try out various local spots bringing art, snacks and drinks together (smart!). 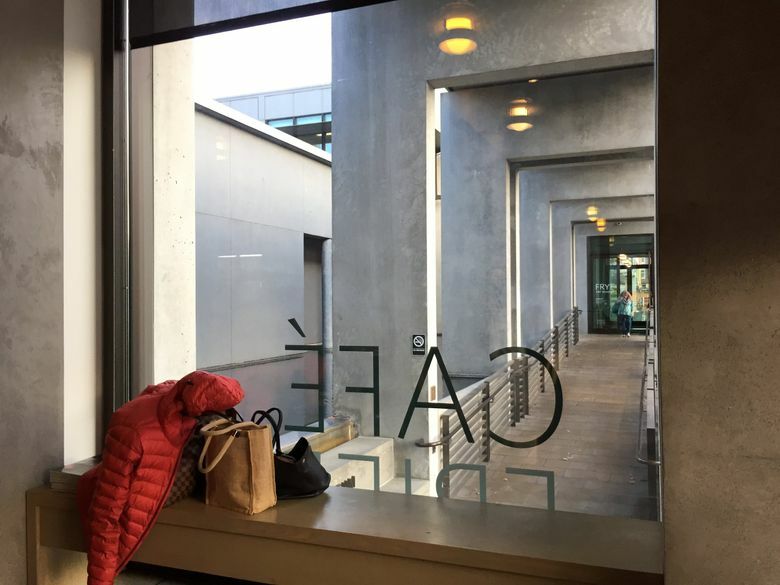 In this first installment, travel and books editor Megan Burbank and food writer Bethany Jean Clement sacrificed themselves on the art/snacks/drinks altar by leaving work early to test out the brand-new Third Thursday Happy Hour Tour at the Frye Art Museum. (Happy hour is Thursdays only from 3 to 6 p.m. at the Frye’s cafe, while the Happy Hour Tour is, you guessed it, every third Thursday starting at 5:30 p.m. The next one is Nov. 15.) Here’s what they liked, loved and could’ve done without. Megan: I agree! Free museums are the ultimate public service, ESPECIALLY in a city that’s become as expensive as this one. I love the weird fountain outside the Frye, I love that it’s not downtown, I love that it’s a piece of Seattle I remember from my artsy childhood that doesn’t (YET) feel eroded or fancy-fied by the influx of tech money and breakneck growth. I could go on, but I might start telling kids to get off my lawn. 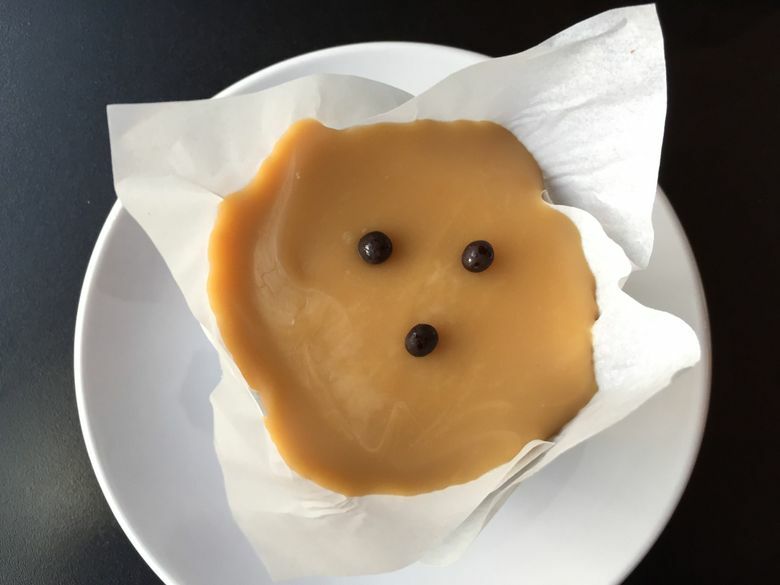 Bethany: We ordered several things, then sat down to wait with glasses of wine and a Macrina dulce de leche cupcake in the Frye’s pleasantly angular, high-ceilinged Cafe Frieda (named after a local supporter of the museum, not Kahlo). The cupcake’s odd configuration of three chocolate-bead decorations made it appear to be looking at us funny, so it seemed best to eat it right away. The cake was — how to put this — aggressively moist, dense and chocolaty, with a very thick lid of super-caramelly, yet also cream-cheesey, sludge atop it. Good sludge! But: sludge. An intense cupcake, even without the staring! 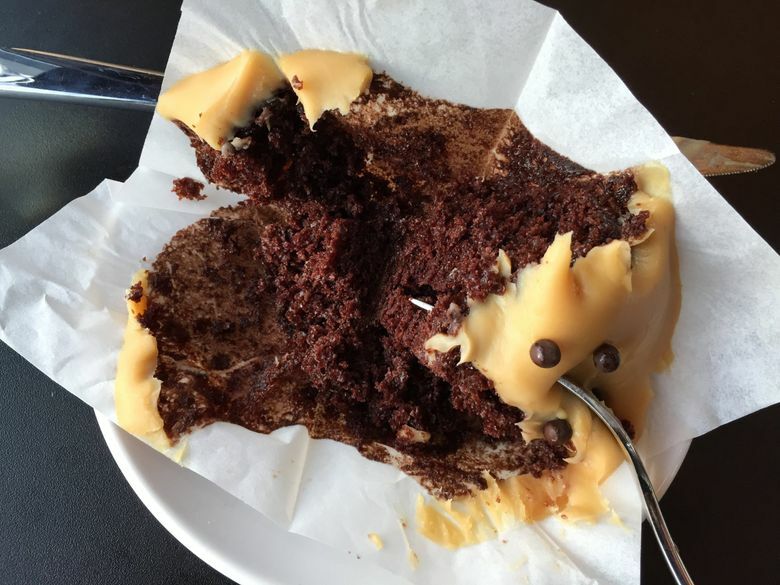 Megan: After mulling it over, I finally realized what upset me about the cupcake: It was the right color and texture to be actual caramel, or caramel-adjacent, but it tasted like, you know, cream-cheesey sludge. It’s like if you’re expecting a sip of milk and get orange juice instead. Even if you like orange juice, it’s weird! There is a sensory disconnect going on. Bethany: What upset me was STOP STARING, CUPCAKE! We made it stop. 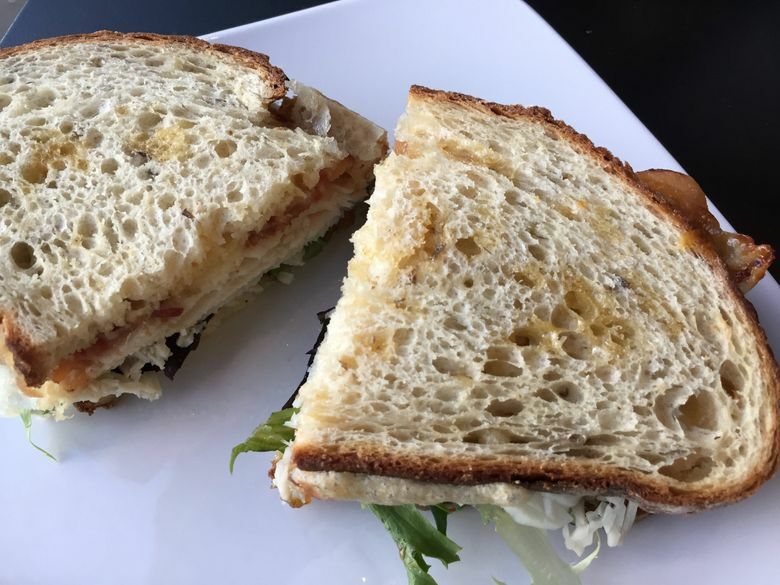 When she got her ham and Brie sandwich, Megan said, “You can’t go wrong with a ham and Brie sandwich [$9.75],” and she was right — hers proved to be a perfectly acceptable specimen and a smart choice, made with a notably fresh Macrina baguette. I wondered belatedly why I had ordered the turkey apricot sandwich ($9.75), which came with an “apricot dijon sauce” that skewed the whole thing sweet (as you might suspect). Still, not bad! Then there was the hummus and pita plate ($5 at happy hour) — it looked very pretty, with olives, radishes and more, but the pita was sad, stiff and dry, and neither the regular hummus nor the spicy beet achieved the kind of rich greatness of which hummus is capable. 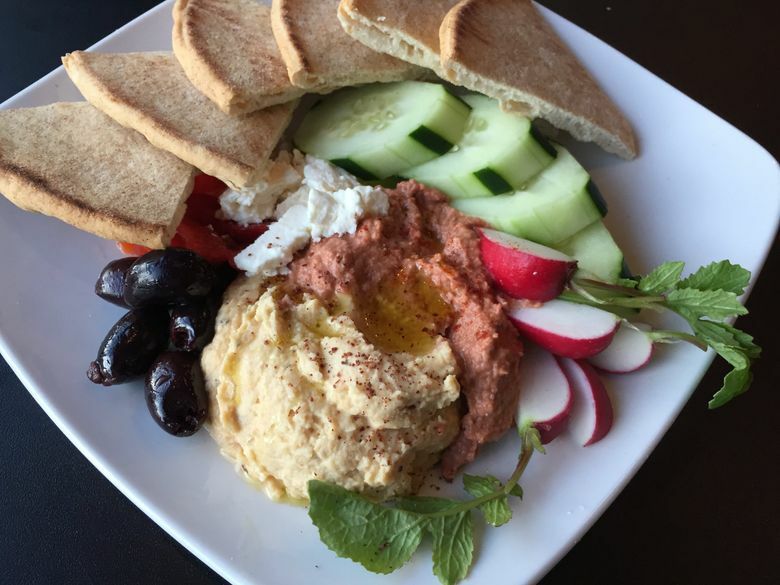 Megan: I do NOT love hummus, which makes me a bad Seattleite and women’s college graduate, so any commentary on hummus must be informed by that, but this was … nothing special? I liked the olives, though! Bethany: The olives did not stare at us, so that’s positive! Bethany: Not a ton to get excited about here — a short menu with a few usual-suspect wine varietals, plus a few beers along Anchor/Full Sail/Fremont lines. But you’re at a museum, having a drink, so cheer up, right?! We both got the Cedergreen sauvignon blanc ($8.25 regularly, $5 at happy hour), thinking, “Better than chardonnay!” It tasted like wine you’d get on an airplane… or at a museum. But still: wine! Megan: The wine was fine! I have no complaints. Usually if I’m drinking wine in an arts space it’s because someone cracked open something boxed at a gallery opening. Being able to sit down and drink a cheap glass of wine BEFORE looking at art is a nice change of pace — very ladies of leisure. 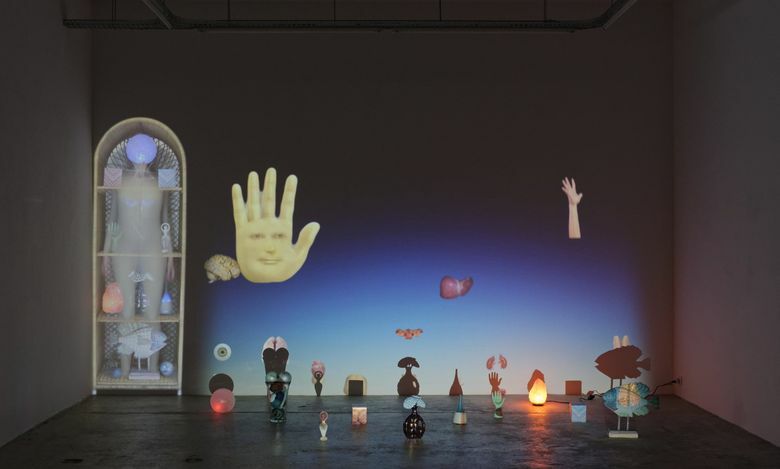 Megan: “Group Therapy” is a HUGE group exhibition of pieces that “comment on and/or adapt strategies of alternative medicine, psychotherapy, and the wellness industry” (showing through Jan. 6, 2019). When I saw that at least one of these pieces includes Sylvia Plath’s glamorous beach portrait, I knew we were in good hands. We usually see depictions of her looking sad and tortured, so whenever I see a piece that addresses her as a person, even in a context focused on mental illness, it’s a good sign. 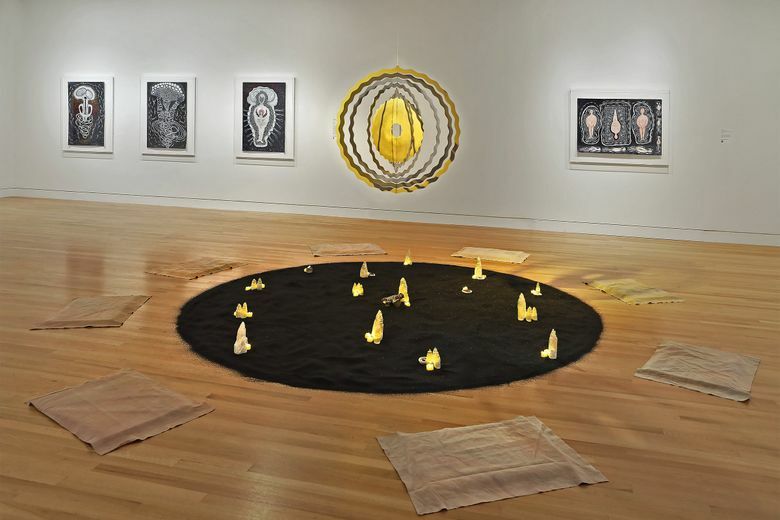 Sylvia appears in a mixed-media Kandis Williams piece examining the intersection between mental illness and hypersexualized depictions of women. I’m not sure it totally landed, but it’s important subject matter and I appreciated the attempt. Also, any chance to see Wynne Greenwood’s work is a chance YOU SHOULD TAKE! Bethany: AGREED — Wynne Greenwood is a genius, and this show gives you the chance to really sink into one of her pieces. There’s so much here to see, and a lot of it really demands prolonged attention. 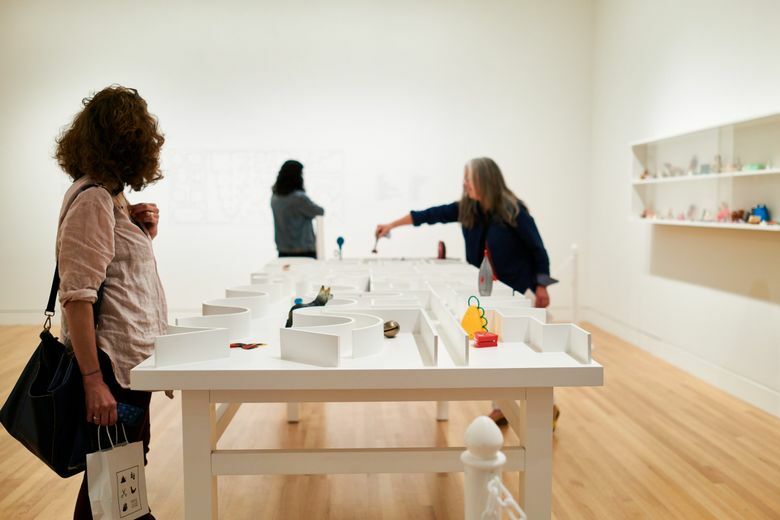 I was intrigued by Pedro Reyes’ “The Museum of Hypothetical Lifetimes,” which, if you’re not on a tour and come during a “Facilitated Activation,” lets you pull talismanic toys out of a glass case and position them in a maze to build, um, a map of your own life and psyche, or something? Elsewhere, there were beanbag chairs to sit upon and headphones full of sounds — all sorts of contemplative stuff involving mushrooms, anxiety attacks and more. One might actually experience some group therapy at “Group Therapy,” which we could all really use right now. There just wasn’t timmmmmmme. Megan: There was a tour. We went on it. It was us and a group of Amazon employees (hi, “Amazon Expressions”!) and a handful of others, and we walked through “Group Therapy” room by room. It was useful to get a sense of each artist represented in the show, but there wasn’t much unstructured time to actually look at the pieces up-close. Maybe other tours include more free-form moments, who knows! Also, at the end we walked into a large room full of paintings of pale-looking children from the founders’ collection, a weird pivot from the contemporary, cerebral pieces. Bethany: The tour went fast — like very fast: Each room got a couple sentences from one of two guides, boom, onward. People kept falling behind to look just a bit more. The guides seemed determined to make the work very accessible, to the point where we both wished for more rigorous commentary. Trust us a little more, Frye! We came on purpose to a museum happy-hour tour — our attention spans aren’t that short. And we didn’t have that many drinks. Megan: Yes, wow, I agree. I think you might be able to simplify AN ART SHOW, but the one we saw was not conducive to such summarizing. 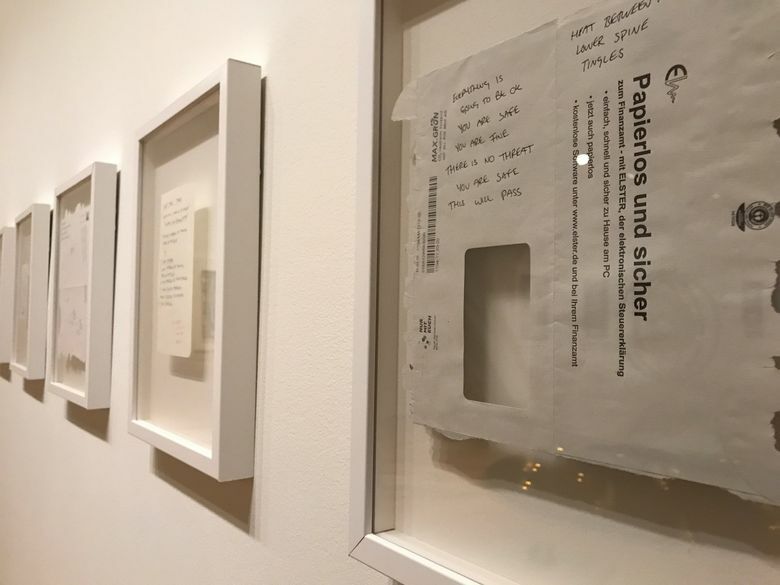 I really wanted to hang out more with the pieces I saw — like Lauryn Youden’s great little handwritten notes to herself, delicate pump-up jams for getting through hard times. Her migraine instructions were a little too real for me, and her work felt substantial in a way that didn’t fit neatly into a minute-long descriptor. Bethany: Yes! I wanted to read every single one of Youden’s listy prose-poems — they seemed soothing but also rife with the various states of panic that induced them, both lulling and ominous. And there’s an entire wall of them! Megan: Generally speaking, art worth seeing + wine = success! EXCEPT. I have a teeny, tiny bone to pick, which is that if you market something as a “happy-hour menu,” it should include more than hummus. How about adding a nice spinach and/or artichoke dip? Or just a bunch of olives by themselves? I would go again, but maybe just get a glass of wine and then look at the art without going on the tour. Is that allowed? Any hour at the Frye is a happy hour, so I would recommend DIYing your own. Bethany: Completely with you on that. The wall text for “Group Therapy” seemed great for self-touring — I actually wished I had time to read it all (pushes glasses up nose). Megan: Besides, with the staring cupcakes, you won’t really be alone. 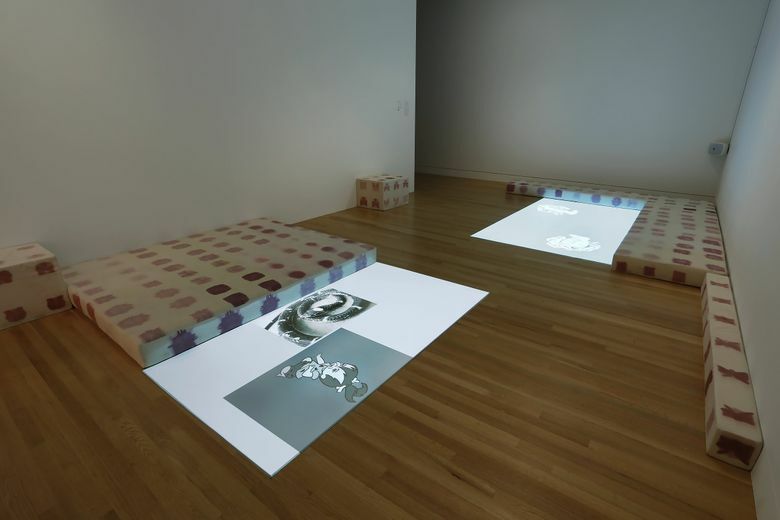 Third Thursday Happy Hour Tours at the Frye Art Museum: Every third Thursday, meet at 5:30 p.m. at Café Frieda at the Frye, 704 Terry Ave., Seattle; 206-622-9250; fryemuseum.org. Regular museum hours: Tuesday-Sunday 11 a.m.-5 p.m., Thursday 11 a.m.-7 p.m. Closed Monday. Admission: free. Regular cafe hours: Tuesday, Wednesday, Saturday and Sunday 11 a.m.-4:30 p.m., Thursday 11 a.m.-6:30 p.m.; happy hour Thursdays 3-6 p.m.